When it comes to online or progressive content marketing and social media marketing, then the financial services industry hasn’t taken a leading position. Now the financial service industries (banks, insurance companies) have realized it’s time to step up their game. The financial services industry currently makes up a striking 14% of all the money spent on online advertising. In this case study, we’ll talk about financial companies available online and creating experience, content and social media that captivates their audiences and brings outstanding brand awareness. In terms of content, financial services marketing teams do a great job of creating separate strategies for each marketing channel. 78% of marketers in the financial industry report using content marketing. Of those who use content marketing, 25% consider themselves to be effective. Brand awareness, engagement, and lead generation are their most important goals for content marketing. For savvy financial companies, social media marketing is a very clear and actionable strategy to attract more business. As per statistics, 62% of financial advisors have stated getting new clients through LinkedIn. This highlights the value of using social media correctly in the world of finance. Even though LinkedIn offers huge value for the financial sector; only 42% of the industry is actively using the platform, compared to the 84% that use Facebook and 63% that use Twitter. American Express is a financial services industry, which was founded in 1850. The company offers services like finance, insurance and travel. Its main products are charged cards, credit cards and travelers’ cheque. It is a perfect example to show how relating captivating content & social media with targeted audience works out perfect. American Express has been publishing content since 1915 after entering travel business. They have been printing journals, handbook, and magazines about travel. But among the financial companies, they are the primary adopters of content. 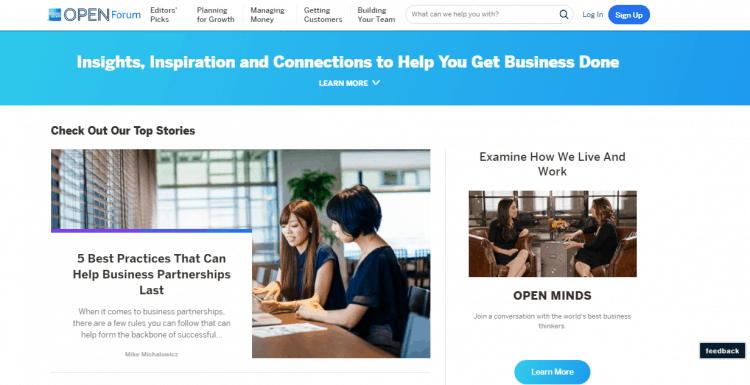 American Express launched OPEN Forum- a place for live events where guest authors from a variety of sectors could connect and learn from each other knowledge and wisdom. By 2008, Amex transformed OPEN Forum into a digital magazine which offers analysis, insights, and resources exclusively for small business owners. In 2009, they also added a social section to OPEN Forum, Connectodox- a networking platform for small business owners, where they are allowed to find right vendors, market their business, and build relationships. American Express went from having nearly no social media presence to have a tremendously strong one in just a few years. American Express is active on Facebook, Twitter, Instagram, Foursquare, YouTube, LinkedIn, Google+ and is constantly experimenting with new and evolving social networks. The financial industry giant is constantly launching carefully crafted social media promotions, letting the brand to build a strong and passionate online community of cardholders. The company doesn’t just aimlessly post content. Instead, they carefully modify each message targeted toward users on that specific medium. We’re so excited to introduce the NEW American Express Cobalt Card to Canadians! Check out our stories to see how and who we’re celebrating with. Citibank is the consumer division of financial services multinational Citigroup. It offers wide range of Credit Cards, Banking Accounts and Loans besides Wealth Management, Insurance Services, and Investments Options. Citi bank is one of the most influential financial services companies which serve as an example of great content marketing strategy. Citi Bank is actively present with almost a million followers on LinkedIn. It doesn’t maintain Facebook, Twitter accounts, but it is also active on Instagram and Google+. It creates Connect: Professional Women’s Network, powered by Citi, which has grown to more than 472K members since its launch in April 2012. It is a forum featuring curated content and moderated discussions to help women become savvier professional networkers and share workplace best practices. The content here covers many of the same themes and the posts- everything here is dynamic and engaging. Video is utilized greatly; while posts about global initiatives are go with by stunning photography. Citi uses social media as solutions to create experiences that would help them to engage with consumers, deepen their relationships and build trust. Mint.com is a free, web-based personal financial management service founded by Aaron Patzer in 2006. The company is a market leader in online personal finance and sold to Intuit for $170 million. 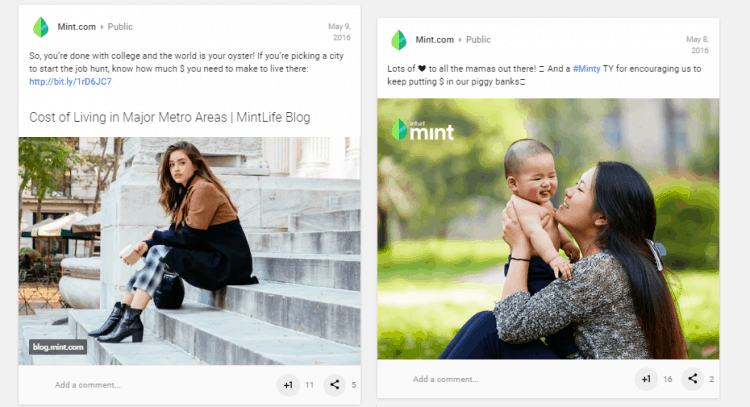 Mint (Money INTelligence) uses aggressively intelligent content strategy for its brand success. Mint’s blog “MintLife” was a core part of the company’s operation. The main reason behind its instant popularity a was unique and fresh article. A tone and voice polished for the millennial. Mint dedicated to a digital strategy publishing hundreds of high-quality content pieces from informative blog posts to viral attention-grabbing infographic to grow their business. Mint added the personal touch to their business by using Facebook, Twitter and other social platform effectively. They had discussions with folks who would comment on their page, held freebies, and promoted their blog through these platforms. Mint became a brand name- a place for all things related finance-Talk finance, trade stories, share advice, etc. The financial flagship of your life was Mint. Online marketing is changing the way the financial services industry operates; the future is bright for increased financial presence, lower costs and better customer service.